Hi my lovelies! How have you all been keeping? For today, I thought I would start things off with a much belated style feature. 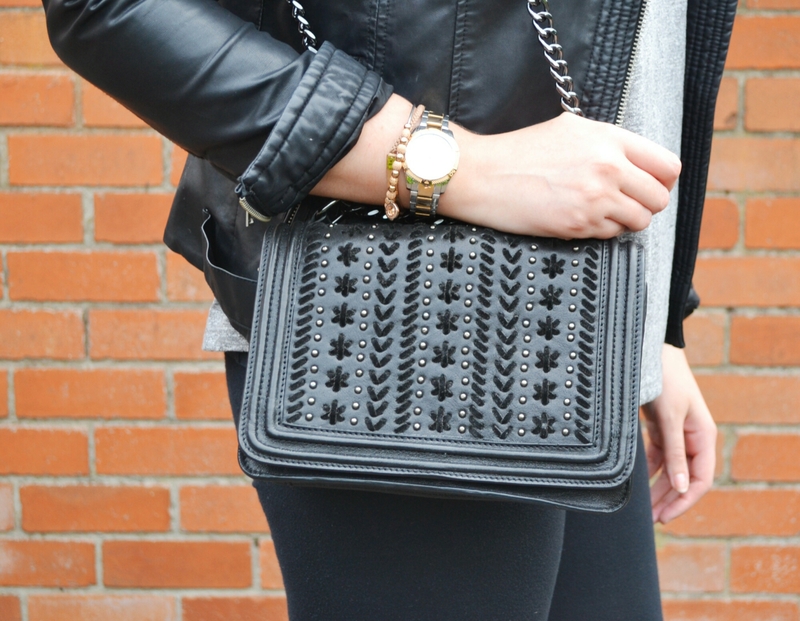 I’m sharing my absolute favourite handbag with all of you from, Zara. I think they’ve sold out of the handbag but I’ve found a similar style for you here. It’s the closet thing I’ll get to owning a Chanel Boy and I treasure it with all of my heart! Haha. I bought this bag a few months back and I have used it on every single night out/event/occasion. Even though it is small, it somehow manages to hold all of my essentials in it, I feel like Mary Poppins with it. The solid block colour makes it incredibly easy to style and pair with pretty much any outfit. I absolutely adore the gun metal chain with the thick black shoulder strap. The detailing on the bag is a beautiful woven style that is perfect for creating a subtle statement. I typically wear it full length but you can double up the strap for a more hold able look. 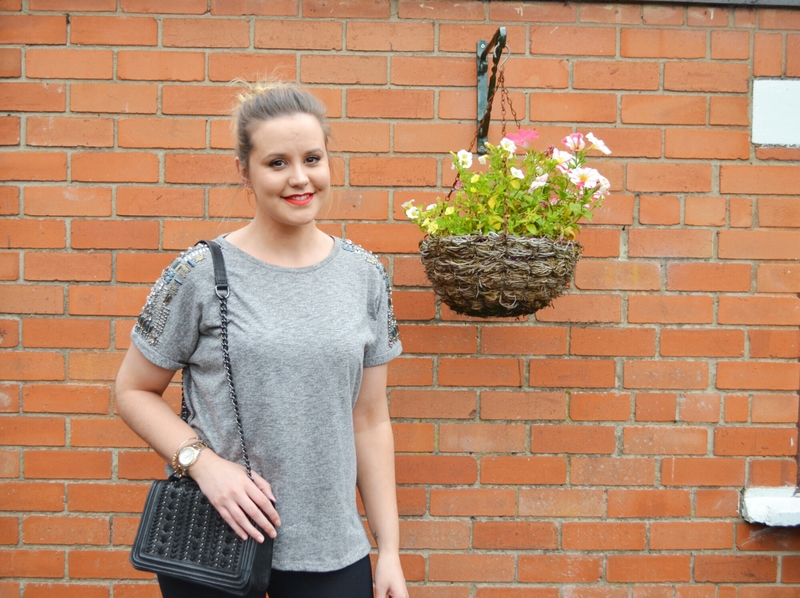 For this post, I have paired it with my embellished Warehouse tee, leather biker jacket and my gold heeled sandals. It’s a pretty laid back look that works beautifully with the bag. 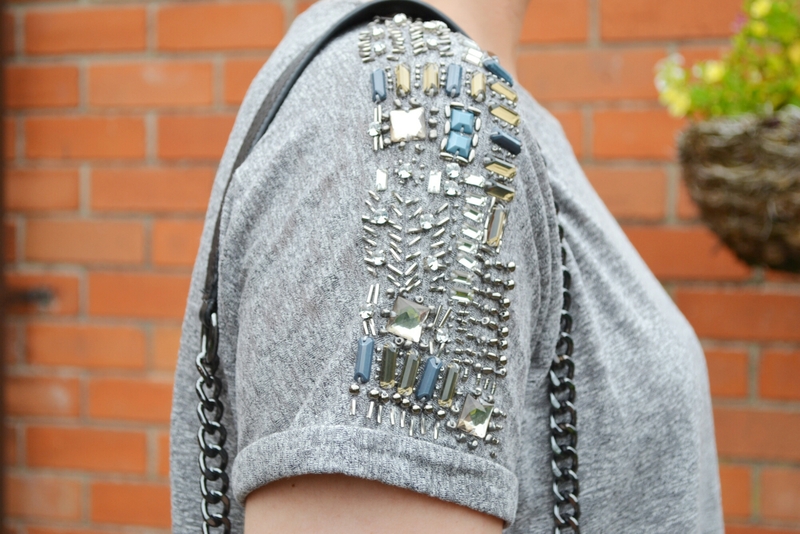 I love the combination of the embellished tee with my bag. I wore a bold lip (MAC’s Lady Danger) and soft smoky eye (Created using my Tarte matte palette) with a casual top knot. I hope you’re all well and enjoying your summer holidays. See you all in my next post. Great find! The look is simple but classy. I LIKE IT!